In beta decay a negatively charged particle (beta particle), known to be identical to an electron, is emitted from the nucleus of an atom, thereby increasing the atomic number of the nucleus by one unit. Fermi worked out in a short time an elegant theory of beta decay based on the idea that a neutron in the nucleus is transformed (decays) into three particles: a proton, an electron (beta particle), and a neutrino. Actually, the neutrino--an elusive, massless, chargeless particle--was not detected experimentally until the 1950s. Their next discovery was a milestone. They found that the level of radioactivity induced in a substance was increased if a paraffin filter was placed in the beam of neutrons irradiating the substance. Fermi's hypothesis for this miracle, which he immediately confirmed, was that in passing through the paraffin, a compound containing a large amount of hydrogen, the neutrons had their velocity much reduced by collisions with the hydrogen nuclei; and these very slow neutrons--contrary to all expectations--induced a much higher radioactivity in substances than did fast neutrons. Furthermore, the old aluminum mystery had been solved: slow neutrons produce one kind of reaction, fast neutrons another. The discovery of the remarkable properties of slow neutrons was the key discovery in neutron physics. With the assistance of Herbert L. Anderson, Fermi produced a beam of neutrons with the Columbia cyclotron, thus verifying the fission of uranium. Then he quantitatively explored the conditions governing its production. He and his coworkers also proved, using a minute sample, that the fissionable isotope of uranium is U235. By mid-1939 there was clear evidence that a self-sustaining chain reaction might be realizable. Furthermore, the stupendous military importance of nuclear fission had become clear. By July 1941 Arthur H. Compton, chairman of a special committee of the National Academy of Sciences, could report the possibility not only of a uranium bomb but also of a plutonium bomb. 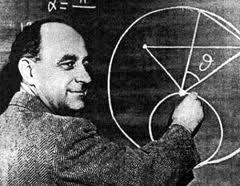 On Dec. 31, 1945, Fermi became Charles H. Swift distinguished service professor of physics and a member of the newly established Institute (now the Enrico Fermi Institute) for Nuclear Studies at the University of Chicago. This was the beginning of a period during which his reading and range of interests--always confined largely to physics--contracted considerably. For a few years he continued working in the fields of nuclear and neutron physics. In 1949 he demonstrated theoretically that the extremely high cosmic-ray energies can be accounted for by the accelerations imparted to them by vast interstellar magnetic fields. At about the same time his interest shifted away from nuclear physics to high-energy (particle) physics. In a number of his researches he used the Chicago synchrocyclotron to explore pi-meson interactions in an effort to discover the means by which the nucleus is held together in a stable configuration.